How does gastric bypass Regina does dinners after weight loss surgery? This weight loss surgery patient is married with three children, ages 8, 11 and 15. She works full-tim e and beyond caring for her family she provides dinner to an aging neighbor who is homebound. This is how she does family dinners after weight loss surgery. “I got this idea from a coworker about a year ago, just as my weight was slowing down and I was looking for ways to get back to preparing family dinners. I called a family meeting after a relaxing Saturday morning breakfast and announced that we were starting the next year off with more family dinners at home. I asked my family to write down their top 5 favorite dinners. Then we went around the table and everybody shared what they liked best about each particular meal. I took notes and adjourned the meeting until the next day. On Sunday afternoon I presented our official list of family dinners. There were 12. I took into consideration everyone’s favorites and spent Saturday afternoon researching the best ways to create lighter versions of each dinner. I explained why it was important that we adopt a healthier way of enjoying our favorites, and that these new versions would still taste good, but not exactly the same. I talked about the benefits of eating healthier, and it wasn’t a hard sell since my kids could clearly see what eating healthier had done for me! 110 pounds off in one year! There were only minor grumblings, but I assured everyone that there would still be a few occasional treats and going out to eat for special occasions. I bought a brightly colored spiral index card pad. I wrote out all the recipes on the front with pretty pens colors of course, and on the back I listed the ingredients, twice. On one side the ingredients were listed by food group, on the other side they were listed by store. I shop at a few different stores and this way if I happened to be at Stater Bros. I could get what I needed there, and the same things for Sam’s Club and Fresh N Easy. 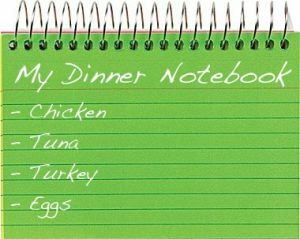 My dinner spiral notebook meals were grouped by main ingredient; chicken, eggs (we love breakfast for dinner), turkey, and fish. If I found a great deal on chicken at Stater Bros that weekend, I would buy more and plan out mainly chicken dinners that week. I would cook most of the chicken on one day and then use it for the next few days. My dinner spiral notebook is always with me. At this point it’s a little ragged so it’s probably time to make a new one and get new dinner ideas from the family. Besides keeping me organized and serving my family healthier dinners, this system has also helped me teach my kids the value of planning ahead and eating lighter. When we do go out to eat, my kids have actually pointed out dishes that could have been made healthier. 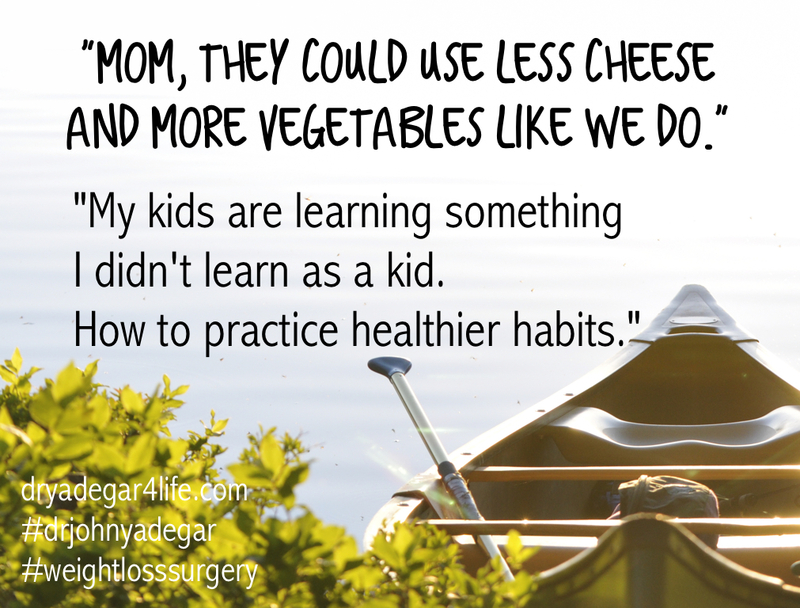 “Mom, they could use less cheese and more vegetables like we do.” I think my kids are learning something from this that I didn’t learn as a kid. They’re learning how to practice healthier habits. And after a year, my dinner spiral notebook is a habit. I depend on it and love it so much that I now have the party food spiral notebook, dessert spiral notebook and holiday spiral notebook.